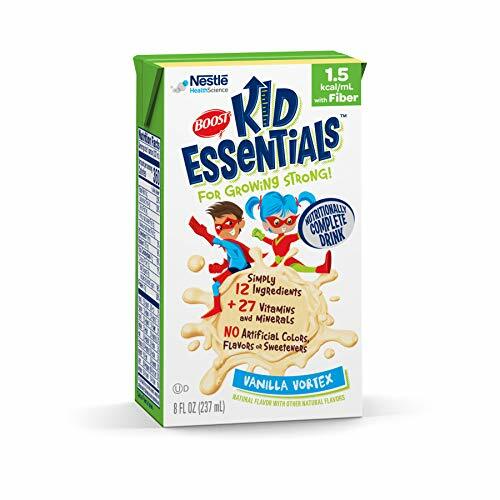 Boost Kid Essentials 1.5 Nutritionally Complete Drink with is a calorically dense pediatric formula that delivers more calories in less volume than a standard 1.0 calorie drink. This special fiber blend helps support digestive health and normal bowel function. Every 8 oz fl serving packs a high volume of 360 calories, 18 g of protein and and is rich in calcium to help build strong bones. Comes in kid-friendly packaging for children ages 1 - 13 and may be consumed orally or used as a tube feeding. Contains CalciLock blend of essential nutrients to support healthy bone development. This nutrient blend includes calcium, phosphorus, magnesium, zinc, and vitamins D, C & K and is designed to support bone health. Although each individual nutrient has a specific role, the nutrients work together to provide the CalciLock benefit. Final Price as low as $42.58 Shipped!